Open the Callexa-App from your Shopify admin panel and click the "Testimonals" button in the navigation bar. You will see two lists next to each other. The first list contains all comments for which the customer gave consent for publication. Chose one and hit the green checkmark button. You can now edit the text, for example to remove spelling mistakes or personal data. The last name of the customer is automatically trimmed to its first letter. When you are done, hit the "Confirm" button. The testimonial now moved to the other list, which contains all "published" testimonials. 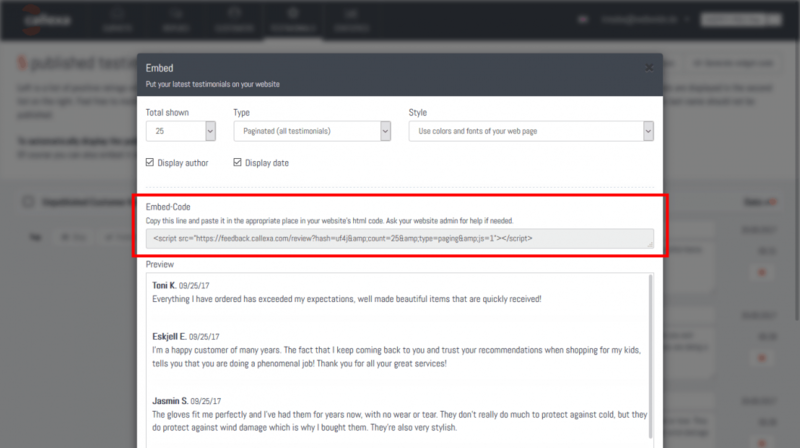 You can remove a testimonial at any time and it will move back to the first list. If a comment doesn't suit you, just click the button with the crossed out eye to hide it. Now you ask, where can those "published" testimonials be seen? To actually display them somewhere, you need to embed the testimonials widget. Click the "Generate Widget Code" button top right of the screen and configure it to your likings. Switch back to your Shopify admin panel and navigate to "Sales Channels > Online Store > Pages". Add a page and name it e.g. "Testimonials". Write a headline and a short intro text, then click the "<>" Button top right of the editor tool bar. Put the cursor at the end of the text and hit ctrl+v to paste the widget code from the clipboard. Note: The widget will not get displayed in the editor pane, as there is no preview available for script codes. Save the page and click the "View" button above the editor. 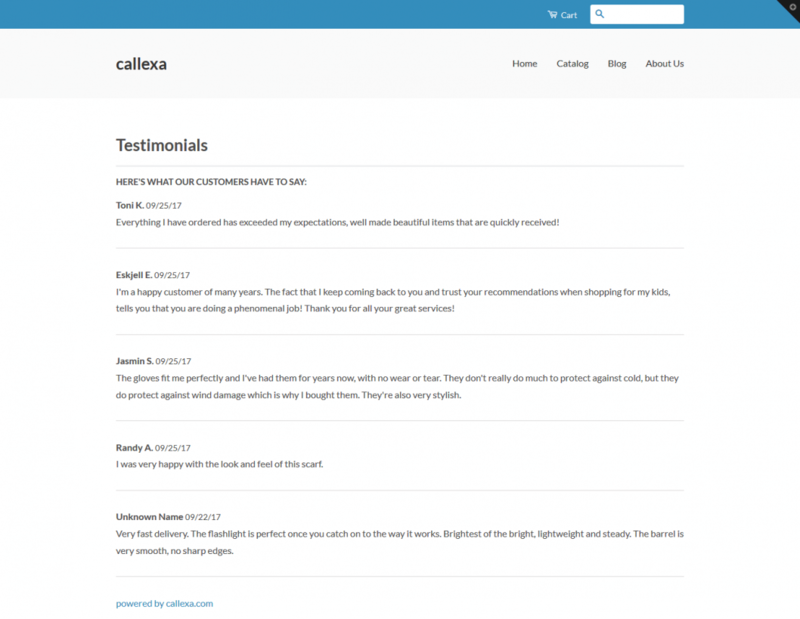 You should now see all the testimonials you published in step 1 getting loaded from Callexa Feedback right into your store. 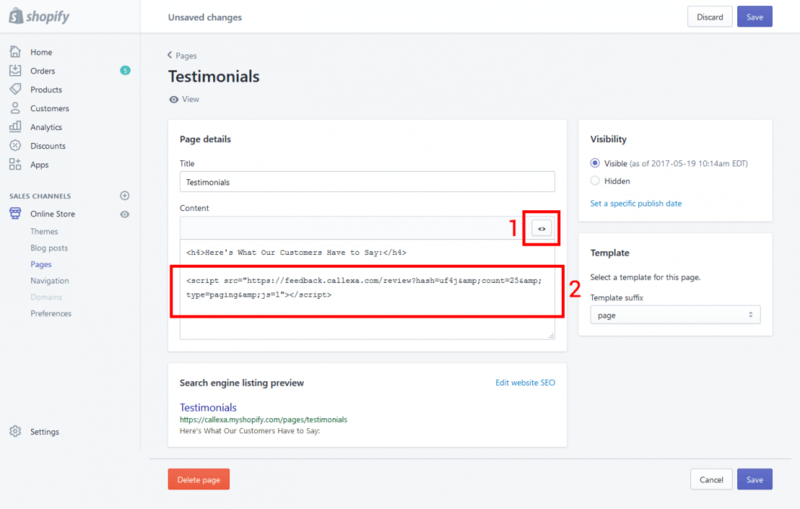 You should also add the testimonials page to one of your navigation menus, e.g. the footer. To do so navigate to "Sales Channels > Online Store > Navigation", select the "Footer" menu and click "Add menu item". 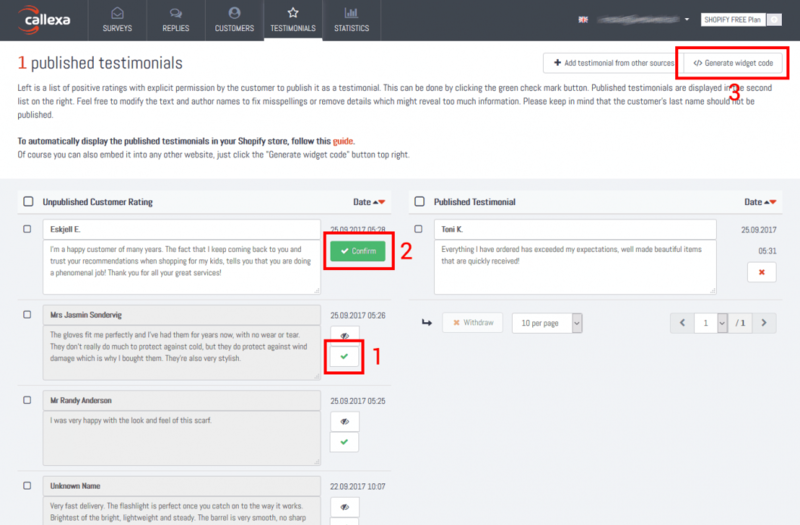 From now on all you have to do is regularly publish new testimonials and they will automatically appear in your Shopify store. The widget code stays unchanged, so you do not need to repeat step 2, 3 and 4.